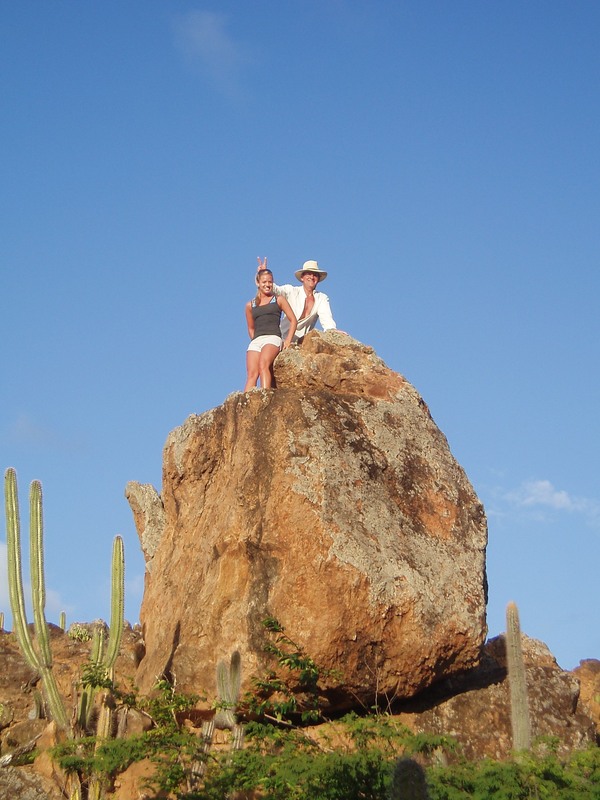 My favorite hike on Bonaire is the Dos Pos hike near Washington Park. I take friends and tourists on this hike numerous times in the year. We always see pigs, donkeys, ferile cats and more. Contact me at ann@bonairecaribbean.com to learn more about this hike. Bonaire dive enthusiasts have another reason to return to Bonaire. I’ve just discovered Amoray, a splendid 44- foot Beneteau owned and chartered by Richard and Sue Willis. Amoray is equipped for comfort and pleasure for her discerning dive or snorkel guests. The skies the limit in choosing where to dive. Bonaire offer’s over 100 dive sites almost all accessible from Amoray. Captain Richard Willis, a Bonaire resident is an elite dive instructor, nature guide and specialist sea turtle conservationist. His wife, Sue works for Sea Turtle Conservation Bonaire and is an excellent first mate. She is also a culinary genius as I learned recently. Captain Richard and Sue hosted me for a lovely happy hour aboard. What a delightful experience where I learned more about this new dive offering on Bonaire. Sure, you can certainly stay at a hotel or villa but imagine having your own three berth yacht, nestled in one of the Caribbean’s quietest and cleanest marina? Whether you are a honeymoon couple or three couples, Amoray is built for comfort. 1 to 2 people $650 includes sailing, diving and snorkelling with an experienced guide, lunch and drinks. 3 to 4 people $700 includes sailing, diving and snorkelling with an experienced guide, lunch and drinks. *Maximum 4 scuba divers, 2 dives per trip, equipment hire and air packages at additional cost. Number of dives possible depends on the chosen sites, weather etc! Exclusive part day sailing and snorkelling packages are also available (subject to availability) from 08:00 to 12:00 or 13:00 to 17:00. 1 to 2 people $350, 3 to 4 people $400 and 5 to 6 people $450, includes gourmet snacks, hot and cold drinks, towels and the use of a private cabin with en-suite facilities. Contact us if you have other specific requirements or timings and we will do our best to meet your needs. *Maximum 4 scuba divers, 2 tanks per person per trip, extra equipment hire and air packages at additional cost. Number of dives possible depends on the chosen sites, weather etc. When booking Amoray with Caribbean Wind & Sun Vacation you will have free Concierge Services as well. Email ann@bonairecaribbean.com today. is the Ultimate Eco Wellness Destination *** Teaming up with Wellness expert, Ann Phelan of Caribbean Wind & Sun Vacations, they are offering special wellness packages to Bonaire, this fall, 2017. Welcome to Sorobon Beach & Wellness Resort, a laid back, ocean front property situated on pristine Lac Bai. The bay is famous as it’s a Mecca for windsurfing. Outside the reef, find the Blue Lagoon which is inhabited by more than 1500 turtles, rays, lobsters, tarpons and other spectacular marine life. The property features rustic bungalows complete with wooden decks and hammocks. Get back to nature. There are no TV or phones but there is WIFI if you need to stay connected to the world. This serene spot is perfect for healing. There is full array of restorative services to heal your mind and body. Experience a healing massage or salt scrub. Take a yoga class as the sunsets. Enjoy a rigorous TRX workout. Savor a healthy smoothie after your spa treatment. Dine on vegan or vegetarian cuisines. The options are endless. Why choose Bonaire? Bonaire continues to be recognized as one of the top destinations worldwide for its pristine marine park. Bonaire has a long history of nature preservation, and always seeks to find the delicate balance between environmental protection and growth, while maintaining nature and culture. Bonaire was one of the first Caribbean islands to collaborate with the Coral Restoration Foundation (CRF) to conserve our reefs. By launching a program to cultivate new corals, specifically the Staghorn and Elkhorn corals, Bonaire will be able to preserve the reef’s genetic diversity. Contact ann@bonairecaribbean.com today. There are special packages for September – Dec. 1, 2017. This is the perfect girls retreat, honeymoon getaway, corporate meeting setting or a mature woman’s “transitional” celebration. Find your center and find your solace on the island of Bonaire.